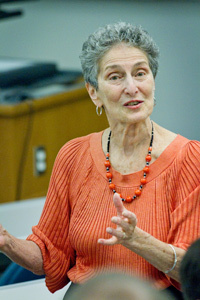 Natalie Zemon Davis is Henry Charles Lea Professor of History Emerita from Princeton University and Adjunct Professor of History at the University of Toronto. Among her many publications are The Return of Martin Guerre (Harvard University Press, 1983), Fiction in the Archives: Pardon Tales and their Tellers in Sixteenth-Century France (Stanford University Press, 1987), The Gift in Sixteenth-Century France (University of Wisconsin Press, 2000), Slaves on Screen: Film and Historical Vision (Vintage Canada and Harvard University Press, 2000), and Trickster Travels: A Sixteenth-Century Muslim Between Worlds (Hill and Wang, 2006). Davis is regarded as one of the greatest living historians and has written a large number of books and articles. She has also written a number of articles about Suriname. Buku – Bibliotheca Surinamica is very honoured to host some essays written by Natalie Zemon Davis.